Mainly clear. Low 57F. Winds NE at 5 to 10 mph.. Mainly clear. Low 57F. Winds NE at 5 to 10 mph. This shows the first sections of public walkways at Live Oak Point, still in various stages of construction and repair on the Port Charlotte side of the U.S. 41 bridge over the Peace River. County administration wants to call Port Charlotte’s side River Walk instead of Harbor Walk. The Charlotte Harbor sign welcomes drivers heading north on U.S. 41 as they enter Port Charlotte from Punta Gorda. Punta Gorda has its Harbor Walk. The question is, should Port Charlotte on the opposite side of the harbor, change its waterside walkways to River Walk? Charlotte County administration wants to re-brand Port Charlotte’s still developing Harbor Walk to be the River Walk. The idea is this will distinguish Port Charlotte’s waterfront esplanade from Punta Gorda’s Harbor Walk on the other side of the U.S. 41 bridge. Step one fell flat, however, with a rejection by the advisory board for the Charlotte Harbor Redevelopment Agency. The board voted 4-0 with one abstention against the proposal on Monday. Member Shaune Freeland did not offer a reason for her abstention. Board member Charlotte Ventola explained her rejection of the name change. Ultimately, however, the decision lies with the Charlotte County Commission, which acts as the redevelopment authority. Commissioners recently removed the authority of the advisory board to review any development proposal in the Charlotte Harbor region. One commissioner has proposed eliminating this CRA due to the advent of the Sunseeker megaresort. The resort with 680 hotel rooms is expected to open within two years, bringing with it millions of dollars in new tax dollars. Sunseeker has committed to building its own 2,150-foot waterfront walkway with public access. Sunseeker is not obligated to follow Charlotte County’s naming, the county’s public information officer, Brian Gleason, told the advisory committee. “They can call their section whatever they want,” he said of Sunseeker, owned by Allegiant Travel Co.
After the advisory board vote, Charlie Counsil of Punta Gorda’s Community Redevelopment Authority told the members that his CRA also wants the Port Charlotte side to change its name to help distinguish one side from another. Punta Gorda Mayor Nancy Prafke said this issue has not come up before the City Council. If commissioners would like the council to weigh in, she said she would welcome the item on a future agenda. Gleason presented the county’s case before the advisory board. He pointed out that River Walk was the original name of the district and the proposed walkway, based on the 2006 redevelopment authorization. “What we want to do is go back to what the CRA board originally envisioned,” he said. Federal agencies consider this location to be riverfront, not a harbor, Gleason said, presenting maps from the National Oceanic and Atmospheric Administration as well as the U.S. Geologic Survey. At the U.S. 41 bridge, the Peace River approaches the mouth of the Myakka River. Charlotte Harbor officially begins far west of the U.S. 41 bridge and beyond Punta Gorda’s Fat Point, Gleason said. Waters then flow into Gasparilla Sound and to the Gulf of Mexico. At issue are three sections of walkway in varying stages of completion. Live Oak Point is a narrow public park not yet completed on the east side of the bridge. The public is already using a section of the walkway that runs underneath and perpendicular to the U.S. 41 bridge. The walkway turns again and heads northwest to where it will eventually connect to Sunseeker’s walkway. Farther along the waterfront on the north end of Sunseeker, the county section begins again with Bayshore Live Oak Park. Repair work continues here on damage done during Hurricane Irma in 2017. Punta Gorda’s Harbor Walk is already busy with walkers. 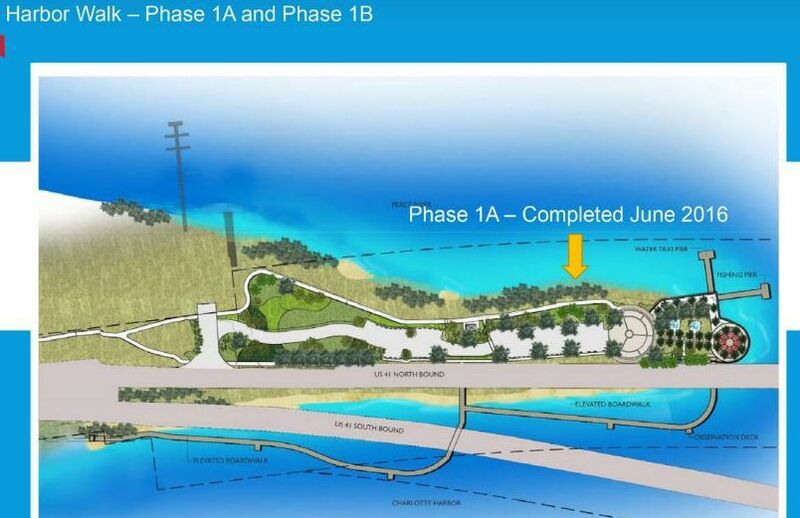 Construction of more waterside pathway is planned on the south side of the U.S. 41 bridge.